Is your baby gasping in sleep? This could mean many different things, from a normal condition to a possible sleep disease. This article will provide you with some possible reasons for this mystery! The first time that I encountered this, my initial reaction was, of course, panic! I was a new mom then, and seeing something strange like that made me worry. After consulting my daughter's pediatrician and baby forums online, I soon found out that I was not alone! It turned out that this is a normal thing. Below are some of the reasons why your little one may be gasping while sleeping. I'll be providing possible causes, as well as things that you can do prevent it from happening. Y﻿﻿our ﻿B﻿aby's ﻿R﻿espiratory ﻿S﻿ystem ﻿I﻿s ﻿S﻿till ﻿D﻿eveloping. Your Baby's Respiratory System Is Still Developing. More often than not, the occasional gasping during sleep is normal in newborns. One of the most common reasons for this is that your baby is still adjusting to life outside of the womb, so they do yet have the same bodily functions as we do. When my daughter was six months old, she would occasionally gasp and breathe heavily while sleeping. This recurred for weeks, so I visited her pediatrician to learn more about what's going on. Later on, I found out that this was because my child still had an immature respiratory system, which means that there are still irregularities with breathing, which is common for babies, especially preemies. The pediatrician said that this is normal, as long as your baby breathes right away after gasping. If you encounter an incident wherein they stop breathing for more than 10 seconds, then it's time to visit the doctor. Otherwise, they should be okay. According to the Children's Hospital of Philadelphia, this condition is "a congenital softening of the tissues of the larynx (voice box) above the vocal cords," and a common cause of "noisy breathing" in infants. Some of the symptoms of this condition include the following: wheezing/noisy breathing, high-pitched breathing sound, difficulty or choking while feeding, or apnea (a temporary stoppage of breathing while asleep). It sure sounds like a complicated term, but there's nothing to worry about! This condition in babies is not serious, as they will be able to grow out of it. Most children should outgrow this by 18 to 20 months. If your child is diagnosed with laryngomalacia, your doctor may do further tests to find out if there are more problems. In most cases, however, the condition is easily resolved. Gastroesophageal Reflux, or GER, is also another possible reason for your baby's sleep gasping. This usually happens because of a poorly-coordinated gastrointestinal tract. 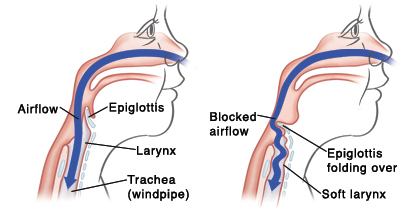 Infants who have GER has gasping, coughing, and wheezing as symptoms. This is in addition to spitting up after they eat. Some of the symptoms that you should take note of are vomiting and loss of appetite or difficulty eating. Don't worry, if your child is diagnosed with GER, your doctor will most likely tell you that they will grow out of it before they turn one. This condition could y be easily treated by altering your baby's eating habits or changing the way you position them on the crib. Don't change anything unless your doctor tells you to, though! Always consult before you try anything new. The more serious condition is GERD, or Gastroesophageal Reflux Disease, which is a common disease in adults. Both GER and GERD can be treated with behavior modification or prescribed medicines - so don't worry! I'd been aware of this condition before. This had happened to me a couple of times when I was in my early 20s. I didn't realize that it also happens to babies! Sleep apnea is a type of breathing disorder that occurs during sleep. Sleepeducation.org defines it as having "reductions and pauses in breathing that occur during an infant's sleep." With infants, these events can increase during the stage of REM. Some of the babies who are most at risk include those who are premature, overweight and have birth defects. Some of the other main symptoms of sleep apnea are snoring and turning blue. The more severe symptoms include turning blue and stopping breathing for short periods, up to about 15 seconds. Two of the general causes of this is developmental problems or another problem caused by another existing medical condition. Your pediatrician will recommend you to a pediatric sleep apnea specialist to undergo more tests if your baby is suspected to have sleep apnea. ​Some parents are horrified by the gasping that they would immediately call 911 or rush the baby to the emergency room. Wake up your child if you feel like there's a struggle, but if there isn't any, just watch them. See how they're breathing and try to count how many seconds per gasp or wheeze there are. If you need to be in the same room all night, go ahead and do it! You will be able to use these observations when it's time to visit the doctor. If the gasping happens often, you can also take a video of your child while he/she is gasping. You can then show the video to the pediatrician if you decide to pay a visit. The doctor may not be able to diagnose right away, but having this on hand will help a whole lot. Take down notes. If your baby gasps frequently (or does anything strange while sleeping), write them down. If you decide to visit your pediatrician, you can show your notes to them for faster, more accurate diagnosis. If the baby stops breathing after more than 8-10 seconds, turns blue after a few seconds, or still gasps/wheezes even after you wake and reposition them, call your doctor or 911 immediately. ​Was this post useful to you? I hope it enlightened you in some way! A baby gasping in sleep is usually just a normal thing, so there's no need to panic. However, if your observations are bothering you, go ahead and consult a doctor! ​I panicked the first time I saw my infant daughter do this but learned later on that there was nothing to worry about. These things are some of the things I learned along the way, and I hope this article was helpful! ​Let me know if you have any comments or suggestions. If you liked this article, go ahead and share them with other parents who you think will find this useful. Good luck!